The Scottish government hopes to implement its named person scheme by August 2017 after a period of "intense engagement" on amendments. Implementation of the scheme was halted after the Supreme Court ruled that data sharing provisions were unlawful. 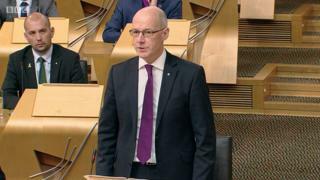 Education Secretary John Swinney told MSPs the government was committed to amending and enforcing the system. The Tories want the scheme to be scrapped, while Labour wants children aged 16 and 17 excluded. The scheme, which would assign a named person to everyone under the age of 18 in Scotland, was originally meant to be rolled out on 31 August, 2016. How did MSPs react to the Named Person statement? What is the named person system? However, after a legal challenge some provisions of the system were ruled unlawful by the Supreme Court. Judges said the principles of the system were "legitimate and benign", but raised fears about information-sharing provisions which could breach the European Convention on Human Rights. The Scottish government then moved to halt the planned implementation until amendments to the Children and Young People Act were made. Mr Swinney has since held talks with public sector leaders and charities to change the legislation and said the government will seek to bring the system into force "as soon as practicable". The deputy first minister said the government would undertake a three-month period of "intense engagement" with key stakeholders and opposition groups. He said he wanted the scheme to be put into place "as quickly as possible". Mr Swinney said: "It is my ambition to work towards a commencement date and these provisions by August 2017." 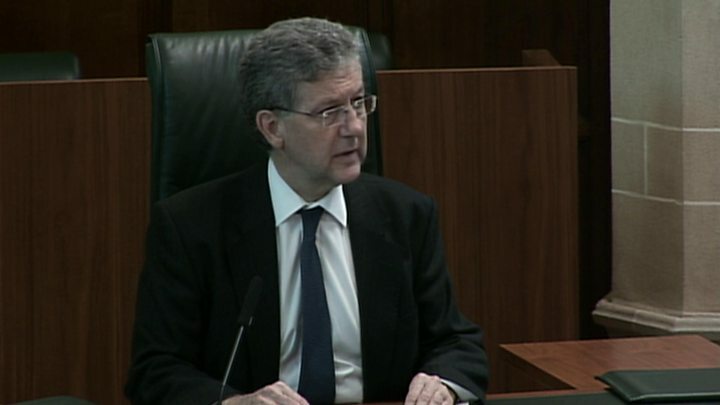 He added: "The Supreme Court judgment provides us with an opportunity to amend the information sharing provisions in the 2014 Act in a way that improves the Named Person service and reassures parents and practitioners and the wider public. "It provides us with the opportunity to continue in the spirit of shared purpose and consensus - to getting it right for every child." The Scottish Conservatives said Mr Swinney faced "key questions". Education spokeswoman Liz Smith said she would repeat her calls for the scheme to be "scrapped", saying "it's what parents, teachers and other professionals want". In the chamber, she asked for reassurance that every local authority had been acting lawfully with the local named person schemes they have been operating. Mr Swinney replied that these councils have been told to make sure the systems they develop are within the framework of data protection and human rights rules. Ms Smith said many legal experts had raised serious concerns about the scheme before the Supreme Court challenge, asking if the government had made a mistake by moving away from a focus on "welfare" to "wellbeing". Scottish Labour, meanwhile, renewed calls for 16 to 18-year-olds to be removed from the remit of the system. Party education spokesman Iain Gray said he supported the general principles of the system, but said the policy has lost the confidence of many families and that must be fixed. He added: "It is absurd that people the law says are old enough to vote, marry, and work are told by the SNP that they need a Named Person. Simply tweaking the law to meet the Supreme Court's concern will not be enough." Mr Swinney conceded that work would need to be done to build confidence in the system. He said the main duty would be to address the points from the Supreme Court ruling, but added he would consider removing older teens from the remit of the system - while highlighting that 16 and 17-year-olds remain vulnerable. Groups which led the legal challenge against the system said Mr Swinney's statement "would be laughable if it were not so offensive". Simon Calvert, spokesman for the No to Named Persons campaign group, said the human rights of parents had been "cavalierly ignored". He said: "Whatever the deputy first minister may claim, the named person scheme he ends up with in a year's time will be very different from the policy he wanted. Instead of focusing on saving face, the government should be apologising to parents for ignoring their human rights. "The 'business as usual' message which the Scottish government had been sending out since the Named Person ruling, was in danger of leading local authorities to carry on with unlawful sharing of private information on families. "Having spent years encouraging the widespread illegal sharing of sensitive personal data, they should now be doing everything they can to put a stop to it." The Educational Institute of Scotland teaching union was broadly supportive of the principles of the scheme but said it was appropriate to review the proposals. General Secretary Larry Flanagan said the government should also look at the level of resources provided to support the implementation of the scheme, in particular around staffing and training at "already stretched" schools. He added: "The named person scheme is a significant piece of legislation, so it is important that time is taken to ensure that it can be implemented effectively and that questions related to staffing and resourcing and the practical, legal and workload implications for named persons, most of whom will be teachers, are addressed prior to implementation."